If a pedestrian walks into the “blind spot” of a forklift truck, there is potential for an accident to occur. The driver may not notice the person before it is too late, or even not at all. According to the German Social Accident Insurance (DGUV), 44 percent of notifiable accidents with forklift trucks in 2016 involved people being hit, crushed or suffering similar injuries. Linde Material Handling now offers a “Surround View” system to prevent such hazardous situations from arising in the first place. In the automotive sector, numerous manufacturers offer so-called bird view system solutions as video-based parking assistance. Such systems consist of several cameras and appropriate software so that the resulting individual images can be combined to form one overall image. The on-board computer then places the contours of the vehicle within this image and displays it to the driver as a virtual bird’s eye view. The “Surround View” system now launched by Linde goes one step further than this. The image display is still based on live data from cameras mounted around the truck, but instead of a single overall image, the system generates a front, a rear and two lateral fields of vision. The big advantage of this solution is that the camera views are displayed 1:1 as a split screen on the monitor at the driver’s workstation. A distorted and therefore possibly unclear representation of the camera’s overlapping areas produced by the simple bird view system is thus avoided. If there is someone in the overlapping area of two cameras, they will be displayed in both fields of vision. Linde’s Surround View System ensures greater safety in narrow warehouse areas and during frequent maneuvering. The camera views are displayed as a split screen. When driving forward, all four viewing areas are shown in the display by default. During reversing, the display changes to the rear and two lateral fields of vision. 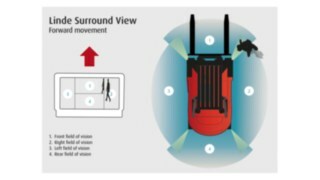 One goal, many measures: The “Surround View” system is another solution with which Linde Material Handling aims to reduce the number of industrial accidents in material handling down to zero in the medium term – following its safety approach “Vision Zero. Safety in your world”.